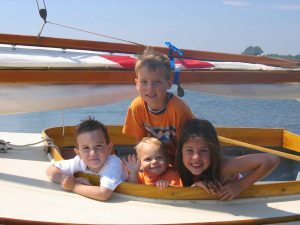 Have you ever thought about sailing as a family but found it to be expensive to own a sailboat, or if you found a sailboat you could afford, it wasn’t suitable for the kids or a family? Well we at the Beetle Cat Boat shop have the solution, a good used Beetle Cat. With over 4,000 of these crafty little sailboats built over the last 95 years there is a good opportunity to acquire a good used Beetle Cat that has many years of service remaining in the 10k range or if you have some wood working skills and want a project for the winter, or maybe a father and son project, one can acquire a project boat in the 1k range, and of course all the parts needed for the project rebuild can be purchased from the Beetle Cat Boat Shop. The Beetle Cat, designed in 1921 by the Beetle family of New Bedford, was intended to provide a small single handed sailing craft that would be safe for children as well as adults to enjoy around the New England coast. The boat has been so successful that families own these boats through several generations. Grandparents teach their grandchildren how to sail in the same boat they sailed as a child. These little boats have provided many years of sailing enjoyment to 100’s of families over the years. With an average life span of 40 years the Beetle Cat provides many years of which to amortize the initial investment. Ease of trailering and rigging, simple maintenance and storage, make the Beetle Cat the ideal boat for a family to venture into years of sailing enjoyment. The Beetle Boat shop has a good selection of used boats that can provide you this opportunity. 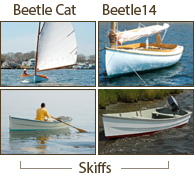 Stop by the boat shop for a visit and get introduced to this world class icon of small boat sailing.